One member of the free agent pass rusher contingent that will not be permitted to reach the market, Frank Clark may be on the verge of reaching a long-term agreement with the Seahawks. The sides are making progress on a new deal, according to CBS Sports’ Jason La Canfora (on Twitter). The Seahawks have until 3pm Tuesday to determine whether Clark will be their franchise player. 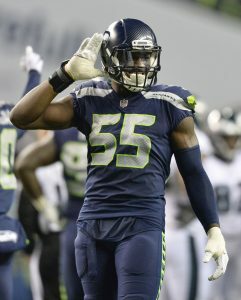 Pete Carroll said this week Clark will be a Seahawk in 2019, so the team will tag the 25-year-old standout if no agreement is reached by Tuesday afternoon. The long-rumored tag scenario — officially worth $17.128MM — would eat into Seattle’s $49.8MM in cap space. Clark joins Jadeveon Clowney, Dee Ford and perhaps Grady Jarrett and Trey Flowers as candidates for that $17MM-plus figure. DeMarcus Lawrence‘s tag will be worth just more than $20MM. Clark has been more consistent than Ford and produced a better statistical season than Flowers or Clowney has, though the latter is a higher-profile player because of his all-around game and draft pedigree. It may take a $20MM-plus-AAV pact to keep him long-term. The Seahawks did not authorize even a $10MM-per-year pact with Michael Bennett or Cliff Avril, so it would be interesting to see how far the team goes for Clark — who backed up this duo for much of his first three years in the league.